The Knightsbridge IP20 Shaver Light with socket is suitable for above sink installations in bathrooms and damp areas. The unit is suitable for fitment in bathroom zone 3. Measuring 490mm length x 60mm width x 70mm depth and weight 1.1 kg, its lightweight and compact. 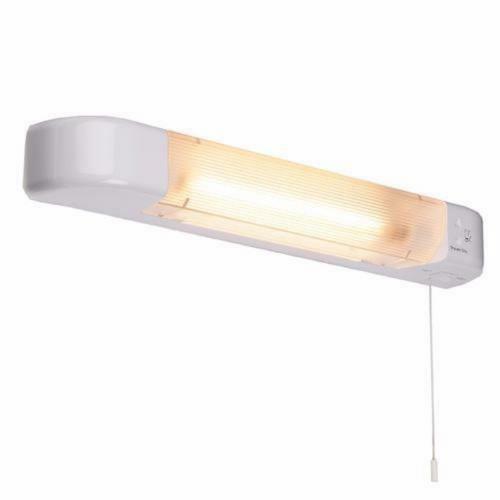 Fully diffused 60 watt non-dimmable 284mm striplight lamp (included) with pull cord switch with dual voltage 110/240v. Socket output can be switched between 230V & 115V. Complies with European Standard EN60598 and comes with a 1 year manufacturers guarantee. Customers who bought this item also bought - double ended clear striplight. Good value. Delivery service very good. I bought this shaver light recently and found it brilliant value for money and an excellent and fast service to boot. hi team a very speedy response from ordering to delivered, very happy customer indeed would recommend this business all times. Is this item fitted by hanging it on two screws, and if so, what is the distance between them? Does the wiring enter the unit from the middle of the back? Electrical World Replies: Hello this fitting has fixing holes at 170 mm centres and there is a cable feed hole in centre of the back.